Senior Rally Day attracts upwards of 500 seniors and advocates from around the state. Presented by the Seniors Count Coalition, this year’s march will occur on May 8 at the State Capitol. Choice in Aging is thrilled to host the 2018 Senior Rally Day page. As a part of the Seniors Count Coalition, we are dedicated to advocating for our elders to ensure their needs are met by the Legislature on every level. 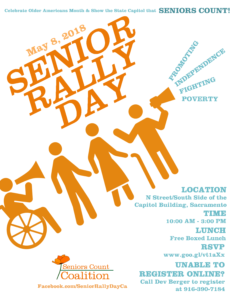 Senior Rally Day acts as a catalyst to bring together our aging community and its advocates to propel our state Legislature to establish and maintain our seniors’ rights. We ask that all that plan to rally please RSVP. You MUST RSVP in order to receive a free boxed lunch on the day of the rally. Click here to RSVP. The Seniors Count Coalition is gladly accepting sponsors for this event. Learn more. Transportation information will be available soon. Come back for more information and to stay up-to-date on everything Senior Rally, as we update this page regularly.